With New Xbox, Microsoft Makes A Bigger Play For Living Room : All Tech Considered Microsoft has had few blockbuster successes in recent years. On Tuesday, when the tech giant is scheduled to introduce its new Xbox, it will be targeting more than just hard-core gamers. Analysts say Microsoft will also be aiming to make its console the center of entertainment in your living room. 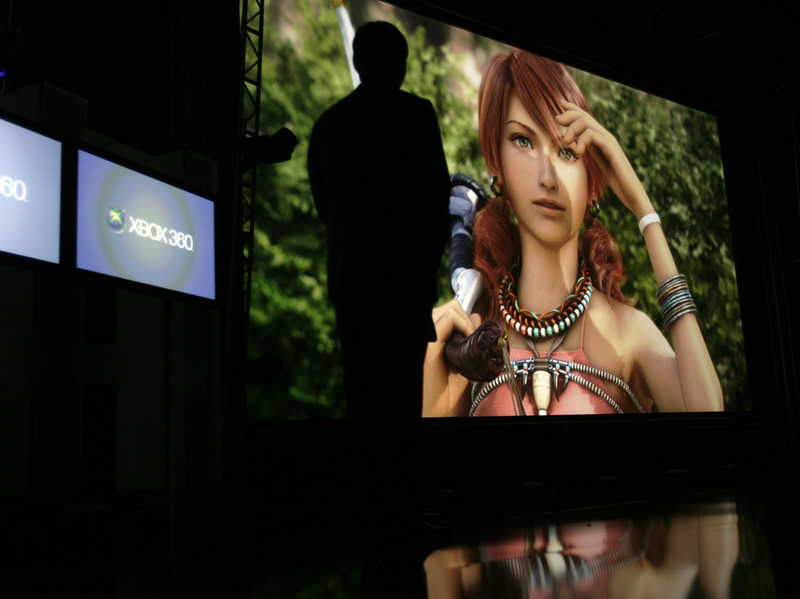 An Xbox 360 video presentation at the E3 Media and Business Summit in Los Angeles in 2008. Microsoft is scheduled to introduce its newest Xbox on Tuesday. The new Xbox will certainly have plenty to entice hard-core gamers. Analysts say it will be faster, have amazingly realistic graphics and as much as two terabytes of storage. Fans of Call of Duty have already been getting tantalizing peeks at the new version and undoubtedly they will learn more about the updated game at Tuesday's event. But, the new Xbox is going to be about more than hard-core games. Microsoft wants to be the center of your living room. It's a strategy that's been working well for the company. According Microsoft, last year people spent more time on Xbox Live (the company's online service) watching TV and movies than they did playing games. Analysts say the new Xbox is going to move the console further down that road. Michael Pachter, an analyst at Wedbush Securities who follows the game industry, believes that a deal is in the works that will turn the Xbox into a cable connection. That means you could switch from playing Call of Duty to watching Game of Thrones without changing boxes. However, Pachter says he isn't certain if Microsoft will announce that at Tuesday's press conference. Pachter says most likely Tuesday will be a preview. Microsoft purchased Skype, so we are likely to learn about how you'll be able to see and chat with your friends while you're watching Game of Thrones or playing Call of Duty. The Kinect, Microsoft's gesture computing device, may be integrated into the Xbox rather than being a separate device. Microsoft is the last entrant into the next-generation console wars. Nintendo launched the Wii U last year. So far, the company that brought us Super Mario Brothers and Donkey Kong has seen disappointing sales. Nintendo does not appear to be making a big play for the living room. Sony has already previewed the PS4 but hasn't said much about whether it will go full force into turning the PlayStation into an entertainment center. Pachter believes Sony will follow Microsoft's lead and gear its new console toward more than games. As technology marches forward, the big growth in gaming is going to be on mobile devices — the smartphone, the tablet — not on consoles. If Microsoft and Sony want to grow, they will have to turn the console into a device that has entertainment features that appeal to non-gamers. It needs to be a device that even grandma might want to buy.